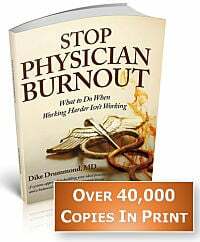 In my work with over stressed physicians I have noticed a consistent misunderstanding of the pathophysiology of burnout – the hidden methods physician burnout uses to sap your energy and steal your passion for medicine. In this post I will show you how Physician Burnout does it’s dirty work. This is vitally important because once you can clearly understand how physician burnout operates, you will begin to see the simple ways you can keep the normal stresses of being a doctor — from crossing the line into threatening your career, your marriage and even your life. Let’s begin by acknowledging that the activities and responsibility of being a physician are ALWAYS stressful. Each and every shift in the clinic or hospital requires a significant input of our energy. As doctors, we are drained on multiple levels by the demands of the clinical practice of medicine every single time we see patients. In addition to the “normal” stresses of our clinical practice, we are also drained by dozens of additional stressors that have nothing to do with your clinical activities. I have written on this previously and as examples of these extra stresses, here are just a few … billing, coding, your EMR, malpractice risk, clinic culture and political uncertainty. 3) “Lack of Efficacy” presenting as thoughts of “what’s the use”, doubting that your work makes any difference and/or questioning the quality of your work. NOTE: I have written previously on recent research showing gender differences in the order in which these physician burnout symptoms occur. It is common to use a battery metaphor to describe stress and physician burnout. “My batteries are run down” or “recharging my batteries” are common phrases you might hear. And that analogy is inaccurate. I will demonstrate why with this question. What happens to a child’s toy when the batteries run out? It stops working, right? As physicians, we are perfectly capable of “running on empty” and continuing to see patients long after we are completely drained and exhausted. Building this capacity to work despite complete exhaustion is a core component of our medical education. Learning how to keep going no matter what — is part of surviving residency. This survival mechanism makes sense if you have a defined end point … like graduation. However, once you get out into private practice … your whole life stretches out ahead of you. There is only so long that you can continue to practice on empty before something bad happens. And empty is just the beginning for many of us. A more accurate metaphor is that of an “Energetic Bank Account”. And like most bank accounts … they can have a negative balance. You can overdraw your energetic bank accounts and continue to see patients. Your work will not be the very best you can do AND you will keep at it – just like you did as a resident. The key to understanding the pathophysiology of physician burnout is to recognize that each of these scales on the Maslach Burnout Inventory correspond to their own “Energetic Bank Account” within the individual physician. Let me show you what I mean. When you look at the three scales of the Maslach Burnout Inventory – each corresponds to a negative balance in its own Energetic Bank Account. NOTE: By “spiritual” here I mean your deeper connection with meaning and purpose in your practice. 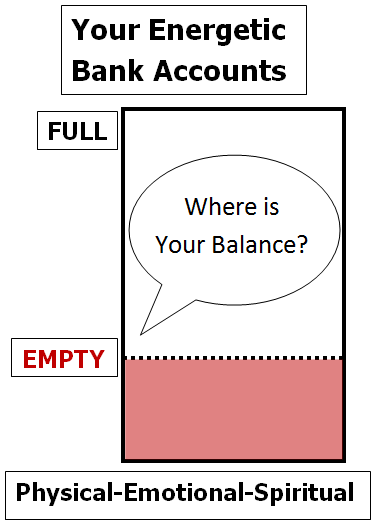 Let’s use this energetic bank account metaphor to understand physician burnout and its treatment. Each time you are in the clinic or hospital you expend physical, emotional and spiritual energy as you see patients. Once you become aware of the existence of the three energetic bank accounts … your job becomes very clear – Keep all three accounts in a positive balance. Let’s see where you are right now with a simple visual representation of one of the accounts. PHYSICAL – how is your energy? Are you in a positive balance? EMOTIONAL – how are you feeling emotionally. Are you getting your needs met with regards to your most important relationships? SPIRITUAL – how connected are you to feeling like your work makes a difference and is a meaningful path for you? With the 3 Energetic Bank Accounts as a way to understand how physician burnout does its dirty work, it quickly becomes obvious there are two main ways to both prevent and treat physician burnout. Sounds simple doesn’t it? The truth is that preventing and treating physician burnout involves a series of simple steps … and none of them are easy for a practicing physician because they sit in a huge blind spot created by your medical education. AND preventing physician burnout is not a “flip of a switch”. It is a series of little steps, done consistently, that collectively produce significant changes. It is a process that takes some time and will absolutely require you to do things differently. I don’t advise any sudden moves here … like resigning. 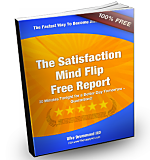 In my experience, 70% of the time you will be able to get back to positive balances without having to quit your current position. Here’s how you can get started. How draining is your average shift at work? What are the situations, people, activities and things that drain you the most? How can you set yourself up to do LESS of those? What are the things you find the most rewarding and enjoyable at work? How can you set yourself up to do MORE of those? Decreasing the drain begins when you take a good hard look at what you hate about work … accept it for what it is … stop the blaming, complaining and making excuses … and make some changes to eliminate some of that stress. What can YOU do now to decrease the stress of the things that bug you the most? In addition to changing the structure of your work day when possible, the most researched and effective stress relief techniques for physicians involve mindfulness training, meditation and breath based stress release. These tools give you the ability to release stress in the moment and have a busy day without taking on stress, worry or fear along the way. What types of patients and/or procedures do you really enjoy? How can you get more of them on your schedule? If you are expert at a particular diagnosis/treatment you love to do … who doesn’t know about your skills in your local community and when and how will you reach out and tell them? These people are potential referral sources who could help you have a better day. What are your favorite recharging activities? Let’s look at the three bank accounts in turn. What things do you do outside of work that you find the most restful and rejuvenating? When can you do more of those? How can you take better care of exercise and eating right? Which of these things could you begin to incorporate into your office day? What relationships in your life give you the most joy and satisfaction? When was the last time you paid them significant attention? Your Spiritual Bank Account is the only one where triple deposits are possible. Whenever you have a patient encounter that leaves you feeling so good you say to yourself, “Oh yeah, THAT is why I became a doctor” – you have just made a deposit into your Spiritual Bank Account. At the same time you will notice increased Physical and Emotional energy. Connecting with purpose and meaning in your practice is a leveraged activity that drops deposits in all three accounts. How can you get more of those encounters in your work day? First you have to be clear on the kinds of things that feed your spirit at work. Remember the last office encounter that gave you the feeling I describe above? Take a moment and write down the details of that patient/problem/situation/diagnosis so that you are very clear on who and what you are looking for. How can you structure your week so that there is a higher likelihood of having these types of interactions? What if you set an intention at the start of each office day to be on the lookout for an interaction like this? One of my clients calls this creating a “treasure hunt”. You can do it too. As you look at the lists of options above … pick one and get started. Notice the difference this change makes in how you feel on the very first day you try it out. If you would like specific advice and support on getting started … I highly recommend a Discovery Session with me. This is a full one hour phone burnout prevention consult. No cost, no obligation … completely confidential. … is to develop new habits that maintain a positive balance in all three accounts. If you look closely at your colleagues who never seem to be stressed or burned out … they have all accomplished this feat. Very rarely it happens naturally. More often it is because of a brush with physician burnout that motivated them to do the exact work outlined above at some point in their career. 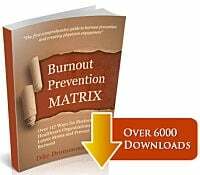 PLEASE LEAVE A COMMENT – what is your first physician burnout prevention step and when will you get started?